Release date: April 2, 2013 | Series: Black Knights Inc.
2. Email your proof of purchase (receipt or picture of the receipt) to sbpublicity@sourcebooks.com. Don’t forget to include your home address (US & Canada only please) so we can send you the Black Knights bandana! If you’ve already pre-ordered this book—not a problem! Send us your receipt! 4. Enjoy Thrill Ride when it arrives in April! 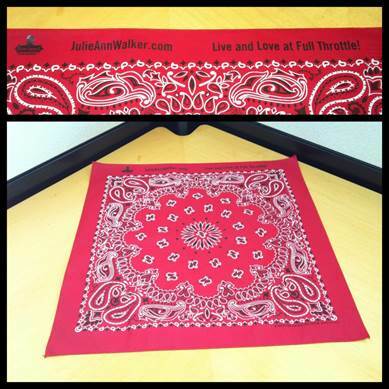 Optional: take a pic of you and your bandana and share it with Julie Ann Walker or Sourcebooks on Twitter and Facebook! You can find Julie @jawalkerauthor and http://www.facebook.com/jawalkerauthor , and Sourcebooks @sourcebooks and http://www.facebook.com/sourcebooks. Release date: August 7, 2012 | Series: Black Knights Inc. I love this series and can't wait for this next won! Thanks! OMG!!! Great giveaway! Crossing fingers! Haven't read anything from this series yet,but the cover is hot! This is such an amazing series!! !